You’re cordially invited—For cocktails, dinner, life lessons and a whole lotta laughs. Date, Time, & Location—Your choosing. This was my first of a lifetime of battles with ideas: the battle of which ones to air and which ones to bury, burn, destroy. Consider yourself lucky that Steve Toltz and his editor did not decide to bury, burn, or destroy too many (if any at all) of the mashup of ideas that saturate this epic novel. 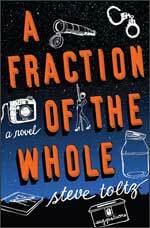 It’s as if caution was tossed to the wind and it was decided that there was no time like the present or no other place than in a debut novel to just go completely for broke and hold nothing back. Although that may seem to raise a red flag or two, no worries. … an odd, uncompromising, walking stew of ideas. For a brief sampling of the menu, read on. Or, if you prefer, stop now and save all the delicious surprises for their proper course. Democracy in crime was turning out no different from democracies everywhere: a sublime idea in theory, soiled by the reality that deep down nobody really believes that all men are created equal. It’s always something here—if there isn’t a riot, then someone’s usually trying to escape. The wasted effort helps me see the positives of imprisonment. Unlike those pulling their hair out in good society, here we don’t have to feel ashamed of our day-to-day unhappiness. Here we have someone visible to blame—someone wearing shiny boots. That’s why, on consideration, freedom leaves me cold. Because out there in the real world, freedom means you have to admit authorship, even when your story turns out to be a stinker. While Terry joined the others in the pool, I subjected myself to a dreadful thing called musical chairs, another cruel game. There’s one chair short, and when the music stops you have to run for a seat. The life lessons never stop at a children’s party. The music blares. You never know when it’s going to stop. You’re on edge the whole game; the tension is unbearable. Everyone dances in a circle around the ring of chairs, but it’s no happy dance. Everyone has his eyes on the mother over by the radio, her hand poised on the volume control. Now and then a child wrongly anticipates her and dives for a chair. He’s shouted at. He jumps off the seat again. He’s a wreck. The music plays on. The children’s faces are contorted in terror. no one wants to be excluded. the mother taunts the children by pretending to reach for the volume. The children wish she were dead. The game is analogy for life: there are not enough chairs or good times to go around, not enough food, not enough joy, nor beds nor jobs nor laughs no friends nor smiles nor money nor clean air to breathe … and yet the music goes on. When you say you don’t believe in the soul, it’s hilarious! People look at you as if the soul, like Tinker Bell, needs to be believed in in order for it to exist. I mean, if I have a soul, is it really the kind of soul that needs my moral support? Is it as flimsy as all that? People seem to believe so; they think that doubting the soul means you are Soulless, the one lone creature wandering the wasteland without the magic stuff of infinity. sublimenauseating-exceptional feelings that’s quite hard to describe unless you happen to chance upon the right word! To feel you know with all your heart Who made the universe, Who manages it, Who pays for it, et cetera, is in effect to disengage from it. The so-called religious, the so-called spiritualists, the groups that are quit to point out that comfort is death think it applies to material possessions. But if comfort is death, then that should apply most profoundly to the mother of all comforts, certainty of belief—far cushier than a soft leather couch or an indoor Jacuzzi, and sure to kill and active spirit faster than an electric garage door opener. Reincarnation without continuance of this consciousness—I just don’t see the point in getting excited about it. Note: The above menu is admittedly, cheap pun be damned, a mere fraction of the whole, and is provided to simply lure you to the table. Who knows? If you aren't careful, when all is said and done, the relentless offering of philosophy just might provide an inroads to personal discovery. Highly recommended. All Major Credit Cards Accepted.